ECI utilizes sound business practices to assess client needs, develop program solutions and execute member services within the resources, both human and financial, of the organization. By optimizing staff, the association can redirect volunteer and financial resources to other needs for more effective program operations. ECI believes virtually any task can be accomplished. For many projects, money often compresses time by providing added resources. ECI identifies opportunities, breaks them down into manageable tasks, and develops solutions to address member and organizational needs. That process is what ECI calls leadership. 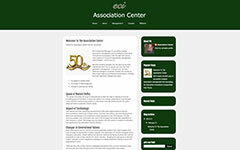 ECI realizes that the true value of any volunteer organization is the knowledge and energy of the members, themselves. Although ECI manages the administrative operations to assure that the proper resources are applied to the development of an organization, it is the members who make the decisions on program policy and emphasis. ECI provides a full range of executive management services for a variety of association programs from in-house bookkeeping to specialized government liaison programs. The following is a list of selected services being provided to in-house clients on an on-going basis. Specialized industry programs can also be provided on a custom design basis. ECI Case Study #3: Members of a small trade association were experiencing occupational safety issues with a transient work force working 2-3 stories off the ground with inconsistent experience and training. ECI developed a home study program allowing member companies to educate their personnel with professional training materials at a minimum loss of time or cost. The certified worker program also became a very useful tool in hiring new employees in a seasonal business. Job openings are currently filled.